"All Are One" is a day of celebration – in words and music – of Divine love, unity and oneness. All are invited to attend this free event. 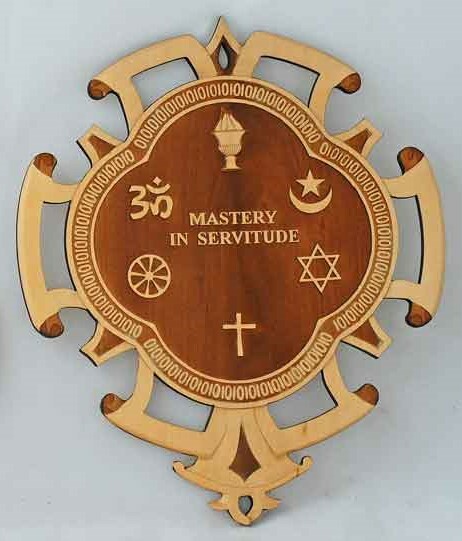 MASTERY IN SERVITUDE is Avatar Meher Baba's mandala which includes the symbols of the world's major religions. This plaque, produced by Beloved Archives, is crafted by Thomas Golding and engraved by the Sisters of the Holy Trinity. One of the most important of those "beads" is Vedanta, one of the great schools of Hindu thought and tradition. It is celebrated for having first stated the principle that the soul is one with God. Ward's talk will explore Meher Baba's message of unity as it relates to Vedanta. He will give a basic introduction to Vedanta and explore some of the commonalities between this great tradition and Meher Baba’s teachings. It is based on the Vedas, the sacred scripture of India. Vedanta affirms the oneness of existence, the divinity of the soul and the harmony of all religions. Vedanta is one of the world's most ancient spiritual philosophies and one of its broadest. After a potluck lunch, there is a musical program featuring songs to the Divine Beloved. Many of the songs were written and composed by Ward Parks. He has written more than 400 songs and ghazals (a poetic form consisting of rhyming couplets and a refrain, each line sharing the same meter). In addition to his editing work, Dr. Parks gives multi-day, intensive seminars and talks on the writings of Meher Baba. Ward first heard of Meher Baba in 1970 when he was a freshman at Harvard University. He made his first pilgrimage to Meher Baba's home in India in 1972. Dr. Parks was a tenured associate professor of medieval studies for 10 years, specializing in Old English at Louisiana State University at Baton Rouge. His most recent editorial work is Meher Baba's Tiffin Lectures: As Given in 1926-1927 (Sheriar Foundation, 2017). It is a record of the dictations by Meher Baba over a 17-month period in the 1920s. It includes 30 full-color illustrations based on diagrams given at the time by Meher Baba. Ward is also the editor or co-editor of the following Meher Baba books: In God's Hand (Beloved Archives, New Jersey, 2000); Infinite Intelligence (Sheriar Foundation, 2005); the Revised Sixth Edition of Discourses by Meher Baba (Sheriar Foundation, 2007); Early Messages to the West (Sheriar Foundation, 2009); and Divine Theme, second edition (Hyderabad: Meher Mownvani, 2010). A dish or beverage to contribute to the potluck lunch. Your food should be ready to eat and not require additional prep or cooking. The group will be eating on the Topa Topa Patio which has limited prep and cooking facilities. Plates, cups, and eating utensils will be provided. A hat, close-toed shoes, and a jacket. "Thursday Tiffin Lectures and the Spiritual Training of the Mandali - A Two-Day Workshop" by Dr. Ward Parks. Bhau Kalchuri, Lord Meher: The Biography of the Avatar of the Age Meher Baba, Online Edition, pg. 1370, accessed September 3, 2017. This quote from Meher Baba was part of an interview with Him in a newsreel by the Paramount Film Company in London in 1932. "What Is Vedanta?" Vedanta Society of Southern California, accessed September 2, 2017.